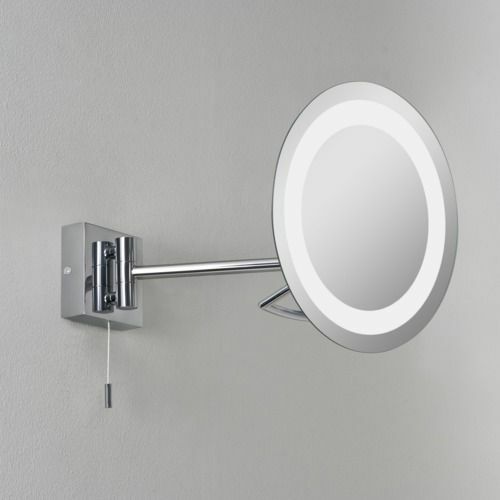 The Gena 488 Polished Chrome Magnifying Mirror is suitable for bathrooms. It has a height of N/A, a width of N/A, a depth of 275mm, & a diameter of 220mm. A Halogen product as standard, it requires 1 x 25W Max G9. The Lumen output (brightness) of this product is dependent upon the bulb you use. The Gena 488 is dimmable, dependent upon the lightbulb you use & the relevant dimmer switch is lamp dependent. This product includes a switch, which means it can be controlled on the product itself & an IP-rating of IP44, which means it can be installed in bathroom Zones 2, 3 (also suitable for zone 1, when the appropriate RCD is used on the bathroom lighting circuit). The 488 is a class 1 product which means it requires an earth connection in your lighting circuit (normally a green & yellow wire). It is not a fire-rated product & no LED driver is required. The manufacturer suggests that this particular product can be mounted on a wall vertically. The product also features a tilt adjustment angle of 45 degrees & a rotation adjustment angle of 180 degrees. Height = N/A, Width = N/A, Depth = 275mm, Diameter = 220mm.